One out of every three people expects UK house prices to increase by more than 6% in 2007, a survey suggests. Some 55% of the 1,500 people polled by financial website Thisismoney said the cost would rise, with one in 10 predicting hikes of at least 11%. One in four of the respondents forecast a rise of up to 5%, but the same number expected a fall of more than 6%. Mortgage lenders say prices were up by nearly 10% in 2006, but many predict more modest rises in the year ahead. 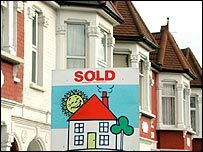 UK house prices have almost tripled in the past decade in absolute terms and some economists envisage falls in the next few years. The thisismoney poll found 10% of people predicted a drop in prices of more than 20% before the end of 2007. But, according to the website, the research indicates people are more upbeat than last year, when opinion was split on whether prices would rise during 2006. Overall, one in five said UK house prices would rise by between 6% and 10% in 2007. Recent research showed homeowners in Northern Ireland were 2006's biggest property winners with towns in the region seeing the largest house price hikes across the UK. The survey from Halifax Estate Agents also found London and the south east of England register strong price growth, buoyed by high City bonuses and a shortage of housing supply.